Our Friday Fave blog series features museum insiders taking a closer look at their favorite works of art. To prepare for the exhibition Nasta‘liq: The Genius of Persian Calligraphy, I pored over the Freer|Sackler’s large collection of related calligraphy, searching for the one piece that would embody the main idea I wanted to convey: that the visual aspects of the nasta’liq script are equal to, if not more important than, its meaning. After a long search, it was actually two pieces that caught my attention—two folios mounted together as a pair, in an album made in mid-eighteenth-century Iran and acquired in 1909 by Tsar Nicholas II. This impressive volume is now known as the St. Petersburg Album. It doesn’t matter whether you can read the poetic verses or not. The contrast between the deep black, graceful lines of calligraphy and the shimmering illuminations and margins is dazzling. Both pages present the same quatrain and both were copied by the same calligrapher, the celebrated Mir Imad al-Hasani, in 1611, four years before his death. Penned on exquisite paper—marbled in pink or decorated with gold floral designs—these two folios represent the ultimate examples of a series exercise: the calligrapher practiced copying a verse until he created an example that he considered perfect. The two calligraphies may look identical at first glance, but there is one subtle difference. In fact, the shape of a single word distinguishes them. On the third line, hich (“nothing”) is compressed in the folio on the right, whereas it shows an elongated ligature between the ha and ya letters in the folio at left. This minor distinction, which a viewer can only identify through long and sedulous contemplation, embodies what I consider to be the quintessence of the visual power of nasta’liq. This feature certainly did not escape the illuminator, Muhammad Hadi. In 1755, more than 140 years after Mir Imad completed these calligraphies, Muhammad Hadi mounted them as a facing pair—though they were not initially supposed to be shown and seen together—and adorned them with lavish gilding. For me, this decorative element simply underscores the perfect beauty of the written lines. See the Nasta’liq exhibition and learn about Persian art and culture at our Nowruz celebration this Saturday, March 7. 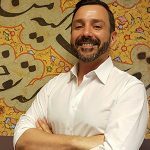 Simon Rettig is assistant curator of Islamic art at the Freer|Sackler.